Basic structure of the root folder of a UNIGINE project. .thumbnails/ This folder contains asset thumbnails for the Asset Browser. Thumbnails are generated automatically by the Editor as you import new assets. data/ This folder contains all assets that are used in your project in both native and non-native formats. It is the folder where all work with the project content is performed. bin/ This folder contains all necessary binary executable files and libraries of the UNIGINE Engine, Editor and plugins as well as binary executable files of your project. data/.runtimes This folder contains files in UNIGINE native formats used by the Engine at run time (such as compressed .dds textures, .mesh geometry, .anim animations, etc.). 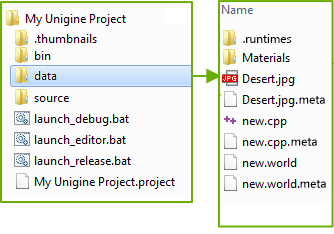 These files are generated by the UnigineEditor for all assets which are not in the UNIGINE's native format (e.g. .fbx, .obj, .hdr, etc.). So, you shouldn't put the content of your project here. source/ This folder stores the source files of your application logic depending on the selected API. These files can be edited in an IDE or any text editor. When changing these files it is required to rebuild the application or its parts. This folder will not be created for projects using UnigineScript API only. *.project Project file. It includes all necessary metadata and settings for your UNIGINE project accessible from the SDK Browser. launch_debug Launcher for the debug version of your UNIGINE project (.bat or .sh file). launch_editor Launcher for your UNIGINE project with the UnigineEditor loaded (.bat or .sh file). launch_release Launcher for the release version of your UNIGINE project (.bat or .sh file). The source assets from the data folder with the valid *.meta files that have no generated runtime files. At that, the *.meta files of such assets aren't included in the final build. The source/, bin/ folders, the *.project file and launchers are excluded from the final build by default. The Version Control article to learn which files and folders of your project should be added to version control.